I've been meaning to take part in Off Life Magazine's quick draw challenge for a while, and luckily for me they fired it back up a few weeks ago and I jumped on board. The basic idea is: they tweet a theme, and you have one hour to respond to it with an illustration. 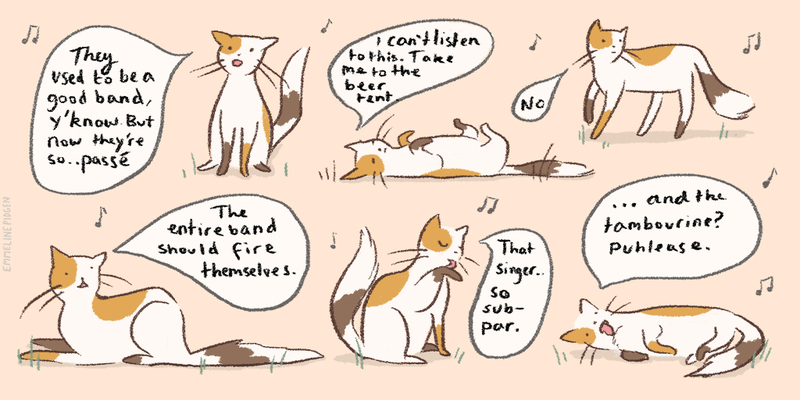 This week, the theme was 'weirdest thing I've seen at a festival', and I ran with it, creating overly-critical-music-snob-cat. I do love the pressure of a timed drawing challenge, and it's always so satisfying when you realise you've sprouted an idea and created something that might never have happened if you hadn't taken part. I'm even feeling inspired to write a story now! *Slightly larger version of the illustration available here.